Beautifully engraved SPECIMEN certificate from the Peirce Wire Recorder Corporation. This historic document was printed by the Columbian Banknote Company in 1948 and has an ornate border around it with a vignette of an allegorical woman with a lion. This is the first time we have seen this certificate. In 1946 - The first licensed wire recorders appeared in the American market, manufactured by Pentron, Peirce Wire Recorder Corporation, and others. The company that became Peirce Wire Recorder Corp. began as Radiotechnic Laboratories of Evanston, Illinois. The Navy and Army Air Force ordered these directly from Peirce Wire Recorder Corp. Peirce marketed these as the Peirce Wire Recorder through Macy's Department Store in New York in September 1945. The company also marketed a dictation machine which used foot pedals for starting, stopping, and rewinding. In 1945, the price was $400, and it weighed over 30 pounds. It had a maximum recording time of one hour. Peirce started working on a cartridge wire recorder in '47 to avoid the problem of removing partially-recorded wires without full rewinding, but believed that a better solution was magnetic tape. The company introduced its "Wire-O-Matic" cartridge machine in early 1949. 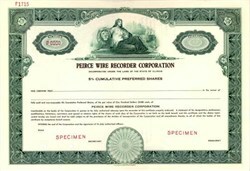 Peirce lost most of its dictation business after the introduction of disk recorders by Audograph and Gray, but was sustained on military contracts for the airborne wire recorder. As early as 1948, Peirce had courted the IBM company, though IBM turned down the offer to buy the 260 series technology. The business recession of 1957-8 drove Charles Peirce to consider selling his enterprise. By August 15, 1959, IBM had acquired the patents and assets of the Peirce company. The last product that Peirce was developing, a small transistorized magnetic belt recorder, appeared in 1961 as the IBM Executive line of dictation equipment.